I’m giving you a big fat autumn hug in the form of pizza. A big fat HIGH MAINTENANCE autumn hug. That’s what this is. As usual though, it’s totally worth it! So while I’ve been doing book tour things, I’ve received one question over and over and over again. Everybody asks what I’m craving or what my favorite recipe from the blog or book is, and, well… I’m the worst at favorites. I mean, monthly favorites I can do, but forever favorites? Now that’s nearly impossible. Don’t even attempt to ask my favorite movie, because it probably falls somewhere between Dirty Dancing, Beaches and then some terrible (yet wonderful) trash like Wedding Crashers. If you ask my favorite song, I’ll give you four James Taylor ones but also throw in a few old school Whitney titles with anything 90s I can get my hands on and whatever current top 40 lyrics I’m flipping at the moment. Favorite book is just a lost cause. How about ALL the books? I’ve been defining my favorite recipes in the book and on the blog by seasons. This seems like a fair gesture where we all win. I still haven’t had any cravings, which is probably the most depressing thing ever since I was SO looking forward to chocolate covered pickles or something. But favorite recipes I can do – especially during my favorite season. So my response for the last four weeks? My response that is completely sincere and true and also awful because I wasn’t home to make it? Brussels sprouts pizza. I know. Weird, right? Followed by a close second of butternut squash lasagna (I’m gonna be real: my version in the book is better than the blog one) and then maybe butternut soup. 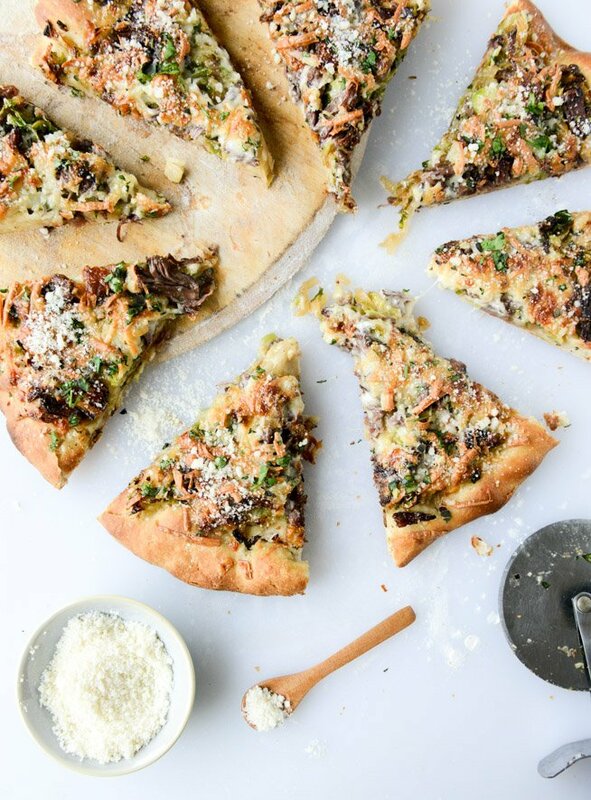 But for weeks I’ve been all about this brussels sprouts pizza. Lots of bacon. And I finally got to make it and devour it and it was delicious. But I still wanted MORE. I wanted to make another version of a brussels pizza, even if it’s a cop out because I’ve already done one. I’m totally certain that pizza is where brussels BELONG. It is really high maintenance. I mean, you need to braise the short ribs until they are falling off the bone. That takes a few hours. I don’t mind though – especially because short ribs are currently my meat cut of choice, even over pork. And it may sound blasphemous, but I actually love short ribs IN things, as opposed to simply served with some mashed potatoes or something. Like this stew. Or this flatbread. Or these tacos. OMG those tacos. Ridic. Therefore, I had no problem braising these babies in cider, caramelizing some onions, crisping up some brussels sprouts and throwing the whole deal on a pizza dough topped with three different cheeses. Heat a large dutch oven over medium-high heat and add olive oil and butter. Season the short ribs with salt and pepper. Add the short ribs (fat side up) to the pot to sear. Sear until deeply golden on both sides, about 3 minutes per side. Pour in the cider, reduce the heat to medium and allow the alcohol to cook out for a few minutes. Once it is not longer smoking, reduce the heat to low and cover. Cook for 2 1/2 to 3 hours, or until the short ribs are falling off the bone. If at any time the liquid level is low in the pot, add a little stock or more cider. You can do this ahead of time! Once the ribs are cooked, remove and let cool until you can tough. Pull the meat from the bone. Note: about halfway through the ribs cook time is when I start the dough. Heat a large skillet over medium-low heat and add the olive oil and butter. Add in the onions with the sugar and stir to coat. Cook, stirring occaisonally, until the shallots are caramelized, about 15 minutes. Add in the brussels and stir to coat. Increase the heat to medium and cook until the brussels are bright green and crisp, about 5 more minutes. Add a pinch of salt and pepper if desired. 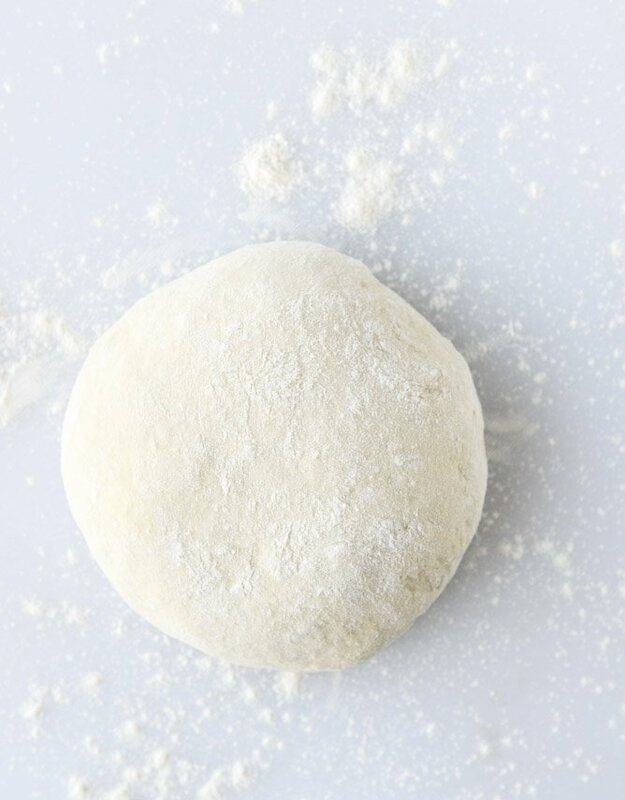 Brush the pizza dough with the olive oil. Add a few handfuls of cheese to the dough, then cover liberally with the shallots, brussels and short ribs. Top with the remaining cheese. Bake for 25 to 30 minute (or a little less if using the stone) or until the cheese is golden and bubbly. Remove and let cool slightly before serving. If desired, sprinkle a little parmesan cheese and fresh herbs on top. That answer would be yes.